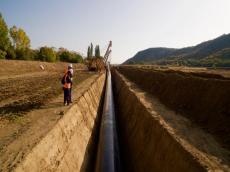 The Trans Adriatic Pipeline (TAP) will enable the complete gasification of Albania, Deputy Minister of Infrastructure and Energy of Albania Enis Aliko told Trend. "Albania will have an exit point from TAP close to Fier, which will be built by TAP-AG, and will enable Albania to get gas from TAP. This will enable Albania to run the Vlora power plant on gas, once it is reinstated," he said. The deputy minister added that the pipeline will also enable Albania to supply two refineries with gas and a heavy-oil crude producer in the region of Fier. "Later, TAP will enable the complete gasification of Albania, in accordance with its Gas Master Plan, and the construction of other gas fired power plants, which will fulfill Albania’s needs for electricity and will avoid electricity imports in times of dry weather and lack of sufficient rainfalls," said Aliko.